If you’ve ever toasted a slice of bread or a marshmallow, you’ve noticed delicious aromas wafting from the food as it turns slightly brown in color. And when you pop one of those toasted morsels in your mouth, you taste a yummy flavor. How do foods like these become browner and tastier as they toast? The answer is through a chemical process called the Maillard reaction (pronounced may-ARD). Named after Louis-Camille Maillard, the French chemist who described the phenomenon, the Maillard reaction is actually a series of chemical reactions between sugars and proteins that occur when food is heated. The Maillard reaction isn’t the only way that food can turn brown. Perhaps you’ve burnt pizza crust in the oven, or noticed an apple slice get darker over time; in both cases, other chemical reactions are involved. But where cooking and baking are concerned, the Maillard reaction is particularly important because it produces distinctive, appetizing aromas and flavors in food that accompany the browning. An oven, toaster oven, or campfire and the help of an adult. Put a couple tablespoons of water in a cup. Add a couple pinches of baking soda or baking powder to the water. Stir with a paintbrush. Add a pinch of cornstarch to thicken it if you’d like. Use the solution to paint a letter or two onto a marshmallow. (It will be invisible!) 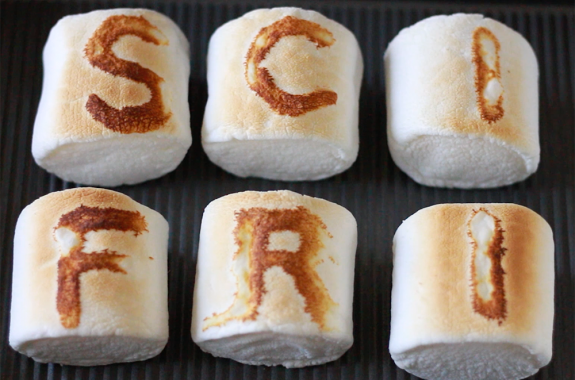 Repeat this step on several marshmallows so you spell out a secret message. When you are ready to reveal your message, toast your marshmallows, with the help of an adult, until the letters are visible. If you are using an oven, place marshmallows on a cookie sheet on the top rack, set the oven to broil, and watch – toasting may take less than a minute! Optional: Use a kitchen timer to record how long it takes your message to appear. Repeat this procedure with just plain water (that is, without baking soda), and see what happens after toasting your marshmallows. What happened? Describe what changes you observed in your marshmallows as they toasted. Can you see the letters that you painted on each? If you can see the letters, are they the same color as other parts of the marshmallow, or different? Describe any similarities or differences that you see. Did the baking soda mixture make the marshmallows turn a toasty brown color faster or slower than the parts that weren’t painted? Lick a toasted marshmallow. Does the part with baking soda taste the same or different from the parts of the marshmallow without baking soda? What happens if you keep toasting the marshmallow? Do the other parts of the marshmallow eventually turn the same color as the letters? Were there any other indications that your marshmallows underwent a Maillard reaction? Did your marshmallows smell different after they were toasted? Aha! The baking soda speeds up the toasting! Look at a marshmallow that you painted with baking soda. The painted area should appear darker than the surrounding areas, which means that it toasted faster. Why would adding baking soda speed up the toasting process? Baking soda is a base, and as it turns out, bases speed up the Maillard reaction. If you licked your marshmallow after toasting it, you should have been able to taste the baking soda on the outside. A substance that increases the rate or speed at which a reaction takes place, without being used up itself, is called a catalyst. Put another way, baking soda catalyzed the Maillard reaction! While bases such as baking soda (also called sodium bicarbonate, or NaHCO3) speed up Maillard reactions, acids slow them down. What do you think would happen if you decided to paint your marshmallow with an acid, like lemon juice, instead of with baking soda? Ask questions: Do you think using a base with other foods would work to catalyze the Maillard reaction? What would happen if you tried painting baking soda solution on bread before putting it into a toaster? Modify the experiment: Try painting letters on your marshmallow with other edible acids and bases, like lemon juice (acid), milk (base), or vinegar (acid). Predict what will happen: For each type of acid or base, make a prediction about what you think will happen as the marshmallow toasts. Do you think the letters will turn brown faster or slower than the rest of the marshmallow? Justify your prediction! Document your experimental results: Photograph your experimental marshmallows, with labels showing what was painted on them. Record your experiment in a journal, detailing what happened and why. Don’t forget to use nifty chemistry lingo, like catalyst and Maillard reaction. Tell other people: What is a catalyst? What is a Maillard reaction? Teach other people what you learned!